As parents, one of our most important goals is to help our children grow up to become healthy, happy and productive adults. In order to accomplish this goal you must begin by teaching your child the importance of healthy living. We live in an ever-changing world where everyone experiences varying degree of stress, even children. Many adults are blinded by the misconception that only grownups experience stress in their lives. Many adults think, “What do kids have to worry about? They have it all planned out and easy? What problems or serious responsibilities do they need to worry about in life yet?”, but that is where they get it all wrong. Our children live in a society that is constantly on the move. Busy parents rushing their children to school in the morning, the pressure to get good grades in school, memory sapping music lessons, chorus, bands, attention seeking friends, the need to fit in, self-esteem issues, and competitive sports. These are just a few things in life that kids endure. The list could go on forever. We usually don’t think of these influences as stressful things for our kids, but in reality, they are very serious in the eyes of a child. The events that accompany our child in their lives have a profound effect on how they focus, feel and will eventuality, it has a huge impact on their self-esteem and their overall future as they journey down the path to adulthood. Reduce Stress – When children learn techniques for self-health, relaxation, and inner fulfillment, they can cope with life’s challenges a lot easier without causing themselves unnecessary stress and anxiety. Improves Self-Esteem and Self-Confidence – Yoga improves a child’s self-esteem and self-confidence using a physical activity that is noncompetitive. Cooperation and Care – Yoga encourages teamwork and compassion instead of conflict and hostility. This is a great gift to give our children. Improves Overall Health - Physically, it enhances their flexibility, strength, coordination, and body awareness. Helps Kids Find Themselves - Kids learn to connect more deeply with their inner self, and they become able to develop an intimate relationship with the natural world that surrounds them. Improves Their Creativity - When yogis developed the asanas many thousands of years ago, they still lived close to the natural world and used animals and plants for inspiration. For example, they used the sting of a scorpion, the grace of a swan, the grounded stature of a tree for inspiration. When children mimic the movements and sounds of nature, they have a chance to get inside another being and imagine taking on its qualities. When they assume the pose of the lion (Simhasana) for example, they experience not only the power and behavior of the lion, but also their own sense of power: when to be aggressive, when to retreat. Not only does yoga build on one’s imagination, but also it teaches children not to act on impulse and to do what is right. Improves ADHD - Science has also noted that yoga can help children with ADHD (Attention Deficit Hyperactivity Disorder). Improves Communication Skills - Yoga helps improve children’s communication skills by exchanging their own knowledge and experiences with others. Children need to discover the world on their own. Doing everything for them or telling them to think harder, to push them to do it better, or forcing your “rights” isn’t always the best way to teach a child. Instead, consider providing a loving, caring, creative environment for them so they can discover the world in a positive and loving atmosphere. 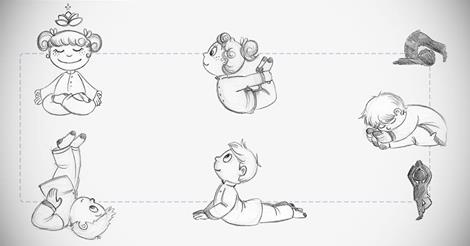 Kid’s yoga can open their hearts and help teach them how to have a happy, healthy and productive life. Yoga will help them explore life from a completely different light. Your kids will have the opportunity to create, express themselves, and grow into happy, confident young adults. A brighter future begins today as we provide a magical learning experience for children of all ages – the magic of yoga begins here.